St Vincent and the Grenadines is a constitutional monarchy and representative democracy with Queen Elizabeth II as head of state, represented by a governor-general. The unicameral legislature, the House of Assembly, has 21 members. Fifteen members are elected at least every five years by universal adult suffrage, six senators are appointed by the governor-general on the advice of the prime minister, and two on the advice of the leader of the opposition. The leader of the majority party in the House of Assembly becomes prime minister, and selects and heads a cabinet. 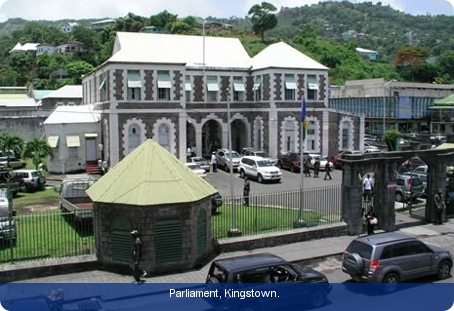 The Eastern Caribbean Supreme Court was established (as the West Indies Associated States Supreme Court) in 1967 with its headquarters in Castries in St Lucia, and is responsible for the administration of justice in its member states including St Vincent and the Grenadines. It comprises the High Court of Justice and the Court of Appeal. The High Court has 16 justices, two of whom are permanently resident in the country and sit in the court of summary jurisdiction. Less serious cases are heard in magistrates’ courts. The Court of Appeal is itinerant. The High Court’s jurisdiction includes fundamental rights and freedoms, and constitutional issues. The islands of St Vincent and the Grenadines, located between the Caribbean Sea and North Atlantic Ocean and north of Trinidad and Tobago, are also known as the ‘gems of the Antilles’. When Columbus sighted the principal island on 22 January 1498, he named it after the saint whose feast falls on that day. The Caribs put up a strong resistance to European intrusion, which prevented colonisation on St Vincent until the early 18th century. The Treaty of Versailles of 1783 recognised St Vincent as a British colony. Between 1960 and 1962, St Vincent and the Grenadines was a distinct administrative unit of the Federation of the West Indies. Internal self-government was achieved in 1969 and full independence came a decade later. Elections held two months after independence in 1979 gave an overwhelming victory to Milton Cato’s St Vincent Labour Party (SVLP), the party which had campaigned most vigorously for independence. In the election of 1984, James Fitz-Allen Mitchell’s New Democratic Party (NDP) was victorious. The NDP was returned to power in the 1989 elections, and also in the 1994 elections, when it took 12 seats. The remaining three seats in 1994 went to the SVLP and Movement for National Unity coalition, which later merged to become the Unity Labour Party (ULP). In March 2001, a victory by the ULP ended almost 17 years of NDP dominance. The ULP won a third consecutive general election in December 2010, and Dr Ralph Gonsalves was returned as prime minister.